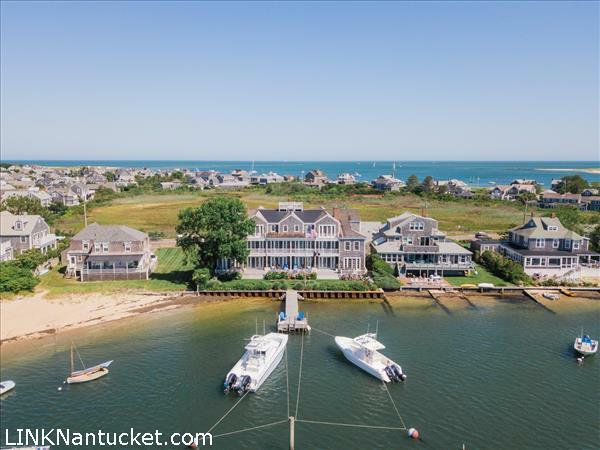 Among Nantucket\’s finest waterfront residences, The Breakers at 42 Easton Street stands as an irreplaceable asset on prestigious Brant Point. One of only a few harbor front homes with dockage located within 0.5 miles of Main Street. Almost every room and bedroom affords a beautiful water view. This townhouse is composed of 10,000+ total square feet with an expansive harbor front deck, 8 generous bedrooms, 9 full baths, 1 half bath and 1 carriage house with a 1 car garage. The Breakers brick entry courtyard is bordered by beautiful stone work and gardens. The grounds are further accentuated by a small low maintenance manicured lawn and a dock with the capacity for 2 boats. Each home opens into a grand foyer with direct views to the harbor. From the foyer, a bright living room with French doors opens onto a spacious harbor front deck with outdoor dining. Adjacent to the living room is a large gourmet kitchen and family room with French doors onto the deck. The kitchen includes double refrigerators, double dishwashers, a six-burner gas stove and butler\’s pantry with three wine refrigerators. Off the entry foyer, the dining room, with seating for 12+, showcases a beautiful hand painted mural on canvas by Mary Webster depicting early Nantucket history. Behind the living room is a spacious office, powder room, wet bar and elevator closet. Three additional water suites are located on the third floor. There is a convenient morning bar for easy access to provisions, an additional laundry station and a terrific living space with 60″ flat screen and full bath. Detached carriage house features a living space with morning bar, bedroom and full bath, laundry station and a loft. Single car garage attached to carriage house. 50\’ dock.